Exploding data banks and constricting budgets are driving small and medium sized businesses to follow the path of big companies in adopting cloud computing, data analytics, and mobile technologies, according to the results of a new survey of 700 small businesses worldwide. 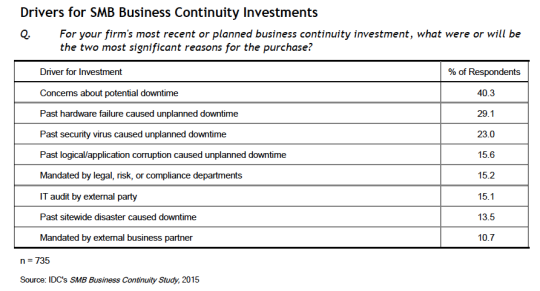 “Small and medium businesses have signaled a need and intention to drive material spending on business continuity,” said Laura DuBois, Program Vice President Storage, eDiscovery and IG at IDC, which conducted the 2015 Business Continuity Study. More than 80 percent of businesses that already use business continuity solutions said they are considering improvements to their strategies, and 72 percent of respondents expect to increase their investments in business continuity over the next 12 to 24 months. The survey found that investments in such services are driven mainly by the threat to reputation, productivity, and profits that unexpected downtime presents to small businesses. According to IDC, the average estimated cost for an hour of downtime for a small or medium business ranges from $8,220 to $25,600. Unplanned events, it says, can go on as long as 24 hours. While small businesses might struggle to maintain on-site hardware, software licenses, or personnel to minimize consequences of an unexpected outage, cloud-enabled backup methods are more affordable and simple. “When it comes to disaster recovery, the stakes are higher for small businesses,” said Mohamad Ali, President and CEO of Carbonite—a cloud and “hybrid business continuity” services provider that contributed to conducting the survey. “SMBs realize that a business continuity solution can mean the difference between staying in business or losing everything they’ve worked for, and the data shows they are investing accordingly.” With 6.2 million SMBs in the U.S. alone, Carbonite estimates the market opportunity for business continuity solutions here at over $17 billion.